This is a real treasury of the most popular Christmas carols arranged for the parish choir. There are 100 carols in total, many with descants, including the classic arrangements of Charles Wood and John Stainer plus newer settings by Malcolm Archer, Richard Lloyd, Sarah Watts and others. This Book is suitable for Soprano and Alto parts, the Mens part is suitable for Men and fits in with the Baritone part. The Ultimate Carol Book: SA Men was published by Kevin Mayhew in August 2008 and is our 21045th best seller. 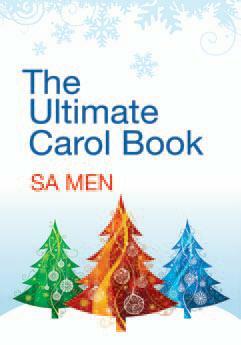 The ISBN for The Ultimate Carol Book: SA Men is 9781848670464. Be the first to review The Ultimate Carol Book: SA Men! Got a question? No problem! Just click here to ask us about The Ultimate Carol Book: SA Men.